How Will Banning Ivory Impact Dealers and Collectors? 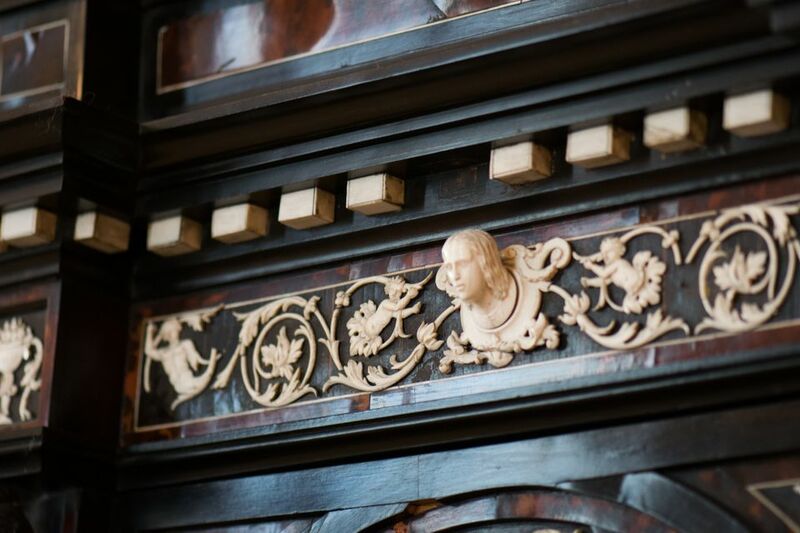 Ivory figure on antique cabinet at the Christiansborg Castle. News traveled through collecting circles in early 2013 as the California Department of Fish and Game began cracking down on the trade of ivory. In fact, Slawinski Auction Company saw armed wardens confiscate close to $150,000 worth of ivory. The raid of flea markets, auctions, and the stock of antique dealers has reportedly continued in California since then, and that includes busting Craigslist and eBay sellers, according to an article by appraiser Wayne Jordan in an article for Worthpoint.com. A year later, President Obama expanded this action to the federal level by instituting a what amounted to very near a complete ban on selling African elephant ivory in the United States. This was primarily prompted by new goods being imported and sold. Elephant poaching in Africa had reached a critical point threatening the extinction of these animals. In 2016, the sale of African elephant ivory was completely banned by the United States government. It’s important to understand that simply possessing ivory you already own is not illegal, nor is passing it on to your heirs. Selling ivory, whether as a business, individual or as part of estate liquidation, is where things get tricky. A Washington Post feature in June 2016 stated, "Selling ivory is now prohibited, with few exceptions, U.S. Fish and Wildlife Service Director Dan Ashe said ... Preexisting items manufactured with ivory such as musical instruments used in orchestras, furniture and items such as firearms containing fewer than 200 grams are exempt. Antiques at least a century old are also exempt, but owners must prove an artifact’s age through a professional appraisal or some other document that can be verified." This extends not only to items made purely of ivory like scrimshaw, netsukes, and jewelry that are more obvious, but those with ivory inlays and embellishments as well such as furniture with marquetry, and clocks along with numerous other antiques and collectibles. Of course, the 200 gram excludes most of the smaller inlays and embellishments. Experts can distinguish the substance by examining it under magnification, and chemical testing can even be done to make a more definite assessment for costly items. The novice seller, however, may confuse it with plastic or other substances used over time to simulate ivory such as bone or celluloid. For now, keep any documentation you have showing that an item made of ivory is more than 100 years old with the piece. This is not only for your reference should you decide to sell, but also that of your heirs later. Dealers should also document objects made of bone, or any other substance that might be confused with ivory, to the best of their ability so those items will not be confiscated from antique shows and shops. The purpose of the expanded federal ban, clearly, is to drive down the demand for African elephant ivory by making trade illegal. This could, however, have the opposite effect by making ivory even more valuable on the black market. That remains to be seen. And, of course, dealers and collectors would only benefit from a rise in price for that reason if they were willing to delve into that seedy marketplace. Most, prudently, won’t be willing to take the risk. Even ivory that remains legal to sell in states other than California, that of Asian elephants and whales among others, may go down as people become reluctant to invest good sums in any type of ivory as they fear of further bans. Some auction houses like Sotheby's in New York stopped accepting ivory items months before the ban, and eBay does not allow listings of any type of ivory at this time. Some states have rigorous laws that expand to other endangered species. For instance, Hawaii excludes not only products containing elephant ivory and rhinoceros horn, but also artifacts made from the hides of numerous other species — seals, sharks, lions, hippopotamuses, jaguars, tigers, leopards, great apes, whales, walruses, monk seals, and cheetahs, according to The Washington Post. For this reason, it's wise to check local laws before trying to sell old items made of a variety of animal horns, teeth, skins, and hides. The artistry found in objects carved from old ivory and made other endangered animal goods won’t diminish, however, no matter how rigorously these types of bans are enforced. These are still items you can enjoy owning while you have them, and then pass them along to your heirs or perhaps to a museum. One thing is for certain, antique enthusiasts feel they most definitely should not be confiscated and destroyed. For the latest news from the U.S. Fish & Wildlife Service on banned items, click here.